For millennia, they were hidden in plain sight - forgotten descendants of a secret race transformed by alien science, living ordinary lives, never knowing their godlike potential. They could be your doctor. Your mailman. Maybe even you. But now the kingdom of Attilan has fallen to Earth. Its royal family has been torn apart. And the Terrigen Bomb has revealed the Inhumans in mankind's midst. As individuals across the globe manifest uncanny new abilities, the Avengers, X-Men, Hulk, Spider-Man and more face a world forever altered. And with her husband gone, Queen Medusa must unite her scattered people and lead them into a new Inhuman Age. I felt like this was a necessary read, just to fill in some of the gaps that I had concerning what was going on with the Inhumans post-Infinity and pre-Secret Wars, and you know what? It really wasn't. The two issues that were directly related the the Inhumanity "event" (a term used very loosely here) were really the only two issues that needed reading. The rest of the issues really didn't feed into the story at all, just providing more issues to make purists buy, in my opinion. Oh, well, those couple of issues did what I needed them to do, filling in those few gaps that I was confused about leading into Secret Wars. If you don't need any gaps filled in, there is nothing wrong with passing on this "event" all together. 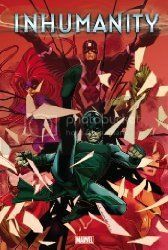 Basically, the main premise of the issue is dealing with the Inhumans place in the world after the fallout of the Infinity storyline, the literal fall of the of Attilan, and Blackbolt and Maximus' detonation of the Terrigen Bomb, which is causing people across the world to grow into there Inhuman legacy. For some reason, I really feel that this Terrigen Bomb and the growing number of super-powered individuals coming out of it is setting the stage for the replacement of mutants in the Marvel Comic Universe with Inhumans, in order to both align it more with the Marvel Cinematic Universe, and to retcon and fix the whole "no more mutants" storyline from House of M.